B.A., N.C.E.H.S., Dip. Acu., Cert Clin. Med. M.T.C.M.C.I., M.C.Th.A. The Acupuncture Facelift is the secret of celebrities and CEO's who want to maintain the glow and vitality of seemingly everlasting youth. But unlike many cosmetic procedures, Acupuncture Facial Rejuvenation works by increasing one's health and vitality from the inside out. Beautiful, radiant skin, few wrinkles and a warm enticing complexion are a reflection of inner health - not just a painted mask. Acupuncture is an ancient Chinese treatment which was used to cure a wide range of illnesses. The concept of acupuncture basically involves insertion of small needles along the meridians where bio-electrical energy flows. According to the history of acupuncture which is 5,000 years old, the Chinese people believed that every living creature has a universal life energy referred to as Qi or Chi. Today we know scientifically that this the movement of energy and electricity along the nervous system. This energy moved around the body in pathways referred to as meridians. These have been seen via electron microscopes and overlay exactly with the nervous and lymphatic system. For as long as our bodies nervous and immune systems can move around the body freely and without interruptions, good health is maintained. However, if theses meridians are blocked at any point, the person will experience pain and eventually fall sick. How does an Acupuncture Facelift work? An Acupuncture facelift is a process where small needles are inserted at certain points on the face and this is aimed at rejuvenating and revitalizing a person’s face. The whole process leaves a person looking younger and feeling better. It does this locally through an increase in blood flow and collagen (the substance that keeps you wrinkle free and firm of skin) to the tissue. Systemically we use specific points to strength the health of the skin, the production of blood itself, increase moisture to the skin and reduce the production of mucous and phlegm that blocks the pores of the skin and leads to spots or acne. Before choosing to engage in this process, it is important to understand that it is not really a facelift. However, if it is done properly, your skin will improve in terms of texture and tightness. 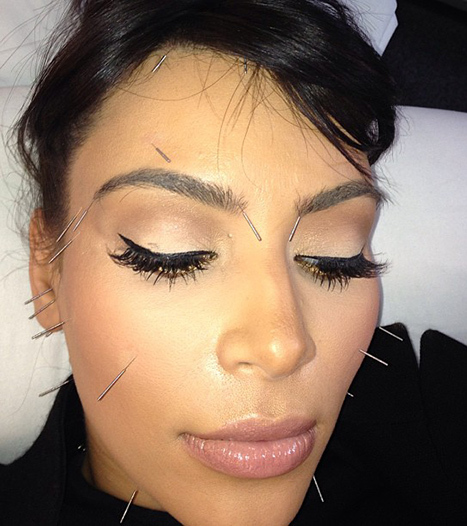 Also cosmetic acupuncture has been found to help one get rid of fine lines and eye bags. Therefore, undergoing this process will definitely leave you looking younger and less tired. When these needles are inserted at acupuncture points, the whole process results in improved blood circulation and facial energy around the facial areas. The end result is more nourished collagen which leads to a more elastic facial skin. It is also important to note that this process is safe for everyone. There is also another benefit that you will receive after undergoing facial acupuncture. Considering the fact that acupuncture is a holistic mode of treatment, you will also get relieve from other conditions which you may have such as weight problems, stress and insomnia. The experience you get after undergoing this process will be determined by the specific locations where the needles are inserted and also whether you have a unique body that will respond adequately to this kind of treatment. When you visit an acupuncturist, you should expect multiple sessions for your cosmetic acupuncture or acupuncture facelift. Some acupuncturist will offer treatment packages that could last for between 15 and 20 days within a month. The cost of undergoing this procedure will vary from one acupuncturist to the other depending on their skill level, experience and level of expertise. You should also be patient because results will take time, though a fresher complexion and noticeable glow is often evident from the first session. For good results, some acupuncturists suggest that you undergo the procedure for about three to four months. The process is also likely to come coupled with other practices such as meditation, massage, use of herbal products, dietary therapy and exercises. When you consider all the other facelift procedures, you will realize that acupuncture is the safest and most beneficial, not just for your appearance but your long term health. There is also no down time after undergoing the treatment. This explains why many celebrities and socialites from Hollywood have started using acupuncture facelift as opposed to surgical facelift. Therefore if you are experiencing facial puffiness, wrinkled skin or sagging skin, you should consider acupuncture facelift. Please feel free to contact me or make an appointment where we can discus any specific concerns or questions you may have. Call my clinic at 087 901 9627 so we can discuss your needs and set up the first appointment. You've been reading about the Acupuncture Facelift. Check out how Acupuncture can help Weight Loss Here. Check out the complete list of treatments available and learn what conditions we can help. All articles and text on this website are Copyright Paul J. O'Brien & The Meridian Acupuncture CLinic © 2007.